Rep. Nancy Pelosi (D-Calif.), who’s been leading Democrats in the House for 14 years—the most recent six of which have been pretty terrible—defeated challenger Rep. Tim Ryan (D-Ohio) with 134 votes to his 63 in a closed-door vote held on Wednesday. Pelosi, 76, who is from San Francisco, represents to Ryan’s supporters (who comprised a fairly significant defection) a coastal, out-of-touch Democratic establishment that lost the blue-collar vote. “We’ve turned into a coastal party,” Rep. Ryan told The Atlantic last week. “You just have to look at the map, and that means you’re a minority party.” But The Atlantic notes that Rep. Ryan, who’s from Youngstown, Ohio, wasn’t such a strong contender; he’s been in Congress for a decade and a half but is best known for advocating mindfulness meditation. Which, to be fair, seems like an increasingly useful skill these days. Trying to quell calls to replace her, Ms. Pelosi announced her nominations last week for a handful of other positions, and proposed that three members from Illinois, Pennsylvania and New York share the leadership duties of the party’s messaging committee, offering more regional diversity. She also released plans to incorporate more junior members into leadership roles, among other ideas, such as including a freshman Democrat in the leadership team’s regular meetings. But each new idea has underscored the fact that Ms. Pelosi refuses to relinquish much power and has cultivated a large, loyal following that does not expect her to. It is from that sizable collection of House Democrats that she draws her picks for smaller leadership posts, making her a powerful ally and, for those like Mr. Ryan who have challenged her, a formidable opponent. But the Post also points out that Pelosi will remain one of three septuagenarians leading the caucus, along with minority whip Rep. Steny H. Hoyer (77) and assistant to the leader Rep. James E. Clyburn (76). (In more heartening news, Rep. Linda Sanchez (D-Calif.) became the first Latina in House leadership as caucus vice-chairman.) 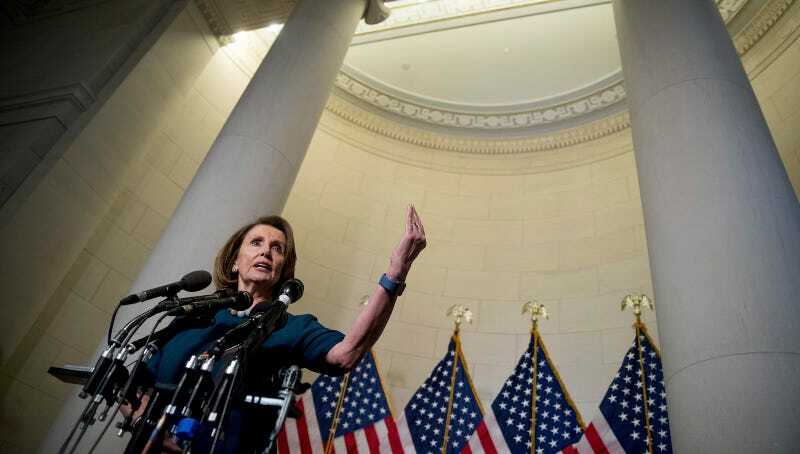 Pelosi supporters like Reps. Elijah Cummings and Eric Swalwell questioned the notion that Democratic leadership is at fault for the party’s persistent losses. “I don’t think we need to beat ourselves up,” Swalwell told Politico, incredibly.